Fast and reliable algorithms for estimating the head pose are essential for many applications and higher-level face analysis tasks. We address the problem of head pose estimation from depth data, which can be captured using the ever more affordable 3D sensing technologies available today. To achieve robustness, we formulate pose estimation as a regression problem. While detecting specific face parts like the nose is sensitive to occlusions, learning the regression on rather generic surface patches requires enormous amount of training data in order to achieve accurate estimates. We propose to use random regression forests for the task at hand, given their capability to handle large training datasets. Moreover, we synthesize a great amount of annotated training data using a statistical model of the human face. 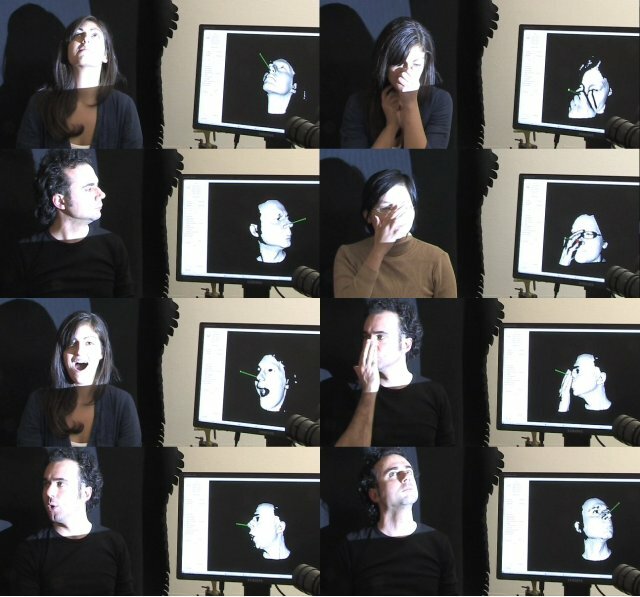 In our experiments, we show that our approach can handle real data presenting large pose changes, partial occlusions, and facial expressions, even though it is trained only on synthetic neutral face data. We have thoroughly evaluated our system on a publicly available database on which we achieve state-of-the-art performance without having to resort to the graphics card. If you have questions concerning the source code or the Biwi Kinect Head Pose Database, please contact Gabriele Fanelli.